"I have a lot of iTunes M4V movies and I would like to burn them to DVD disc so that I can enjoy iTunes movies on DVD player. But I don’t know how to do it? Any ideas?" To answer the above question, the best choice is to convert iTunes M4V movies to VOB, a friendly format to DVD. VOB (Video Object) is a container format in DVD-Video media, based on MPEG program stream format. 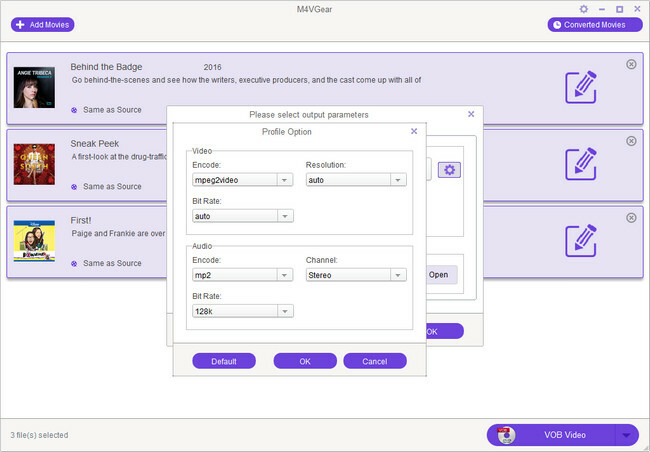 As one of the most common formats for streaming movies to DVD disc, VOB contains video, audio, subtitles and DVD menus together in a stream form. Therefore, a VOB file can be one GB sometimes. 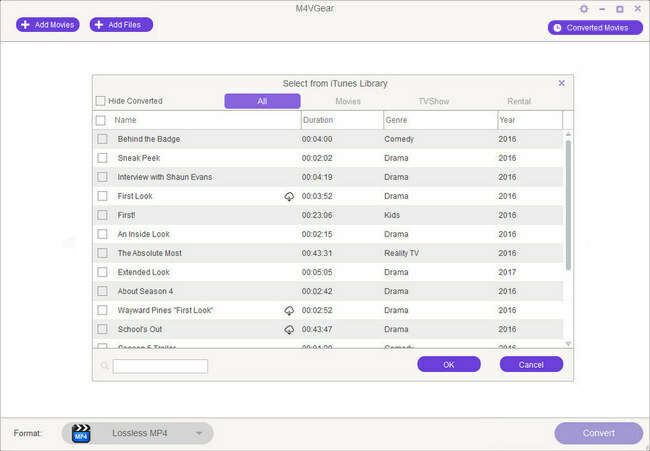 About playback, VOB files can be played on MPlayer, VLC media player, GOM player, Media Player Classic and more platform-specific players like ALLPlayer. It’s known to us all that iTunes M4V movies have DRM protection and can’t be converted to other format directly. Fortunately, M4VGear M4V to VOB Converter ( For Mac & For Windows) can help you make it easily. It’s a professional DRM removal tool for iTunes purchased and rented movies. With this easy-to-use tool, you can remove iTunes DRM legally and convert M4V to VOB. After conversion, you can burn the converted VOB movies to DVD disc with Any Video Converter Free. The following is a detailed tutorial about how to convert iTunes M4V movies to VOB with M4VGear M4V to VOB Converter on Windows and burn the converted VOB movies to DVD disc with Any Video Converter Free. 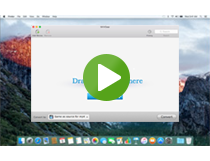 At first, you can download and install the converter on your Mac or Windows. Open M4VGear M4V to VOB Converter. Click "Add Movies" button on the top-left or in the center, there will be a list of your iTunes purchased or rented movies. Choose the movies you need and then click "OK". Batch conversion is supported. 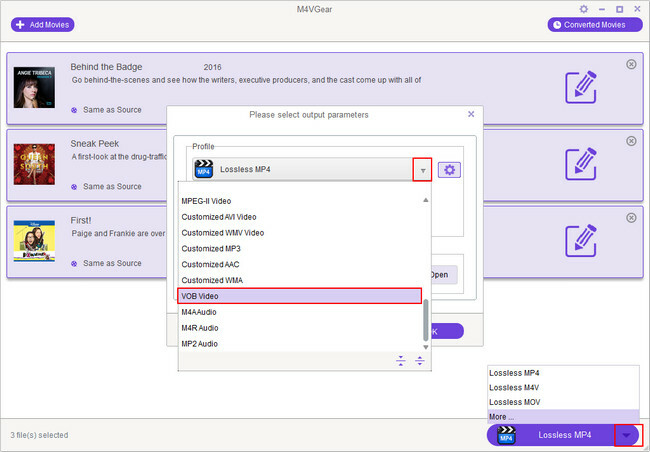 Go to the dropdown list next to "Convert to", choose the output format "VOB Video" under "Custom Settings". You can also manually set the parameters like Codec, Bitrate, Size and Scale by clicking the VOB icon. Note: You can set the related video and audio parameters if possible (resolution, frame rate, bit rate, sample rate and audio channel etc). Click "VOB Video" button on the bottom-right. During the conversion, please make sure you are not clicking on the button to control iTunes. After conversion, you can find the movies in the output folder. Step 1. Launch Any Video Converter Free, go to "Burn DVD" window and click Add Video(s) button to add the converted VOB movies. Step 2. Click "All" on the upper right and choose DVD. Then choose "DVD video NTSC Movie" or "DVD video PAL Movie" as output format according to your DVD player system. Step 3. Click "Convert NOW!" Button to start converting and burning videos to DVD. Insert your DVD disc, select recorder from the drop-down list, enter your desired Disc Label and click "Burn" button to start burning VOB movies to DVD. Step 4. In the "DVD Burning Engine" window, click "OK" button, the drive automatically ejects the disc. Then you can enjoy iTunes movies on your DVD player. Note: The trial version of M4VGear M4V to VOB Converter allows one minute conversion. You can purchase the full version with only 44.95 while the original price is $49.95.